To increase strength and dexterity in your hands after stroke, hand therapy ball exercises are a great, affordable option. Although hand exercise balls are simple, there’s a lot you can do with them to strengthen your hand. Below, you will find 8 hand exercise ball exercises that can help improve fine motor skills after stroke. Practice them with high repetition to help rewire and heal the brain after stroke. 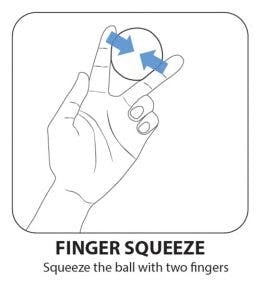 Squeeze the ball with your fingers and thumb. 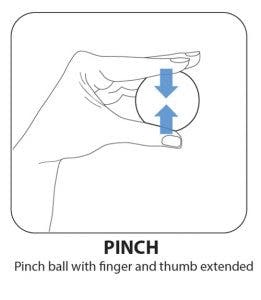 Pinch the ball with your fingers and thumb extended. And by extended, we mean keep all your fingers straight. This will help strengthen different muscles that the ones targeted by curled fingers. 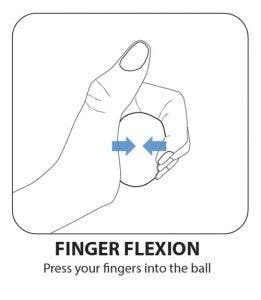 Roll the ball up and down your palm by flexing and extending your thumb. With your palm flat (as flat as you can), place the therapy ball on your palm and use your thumb to keep it in place. 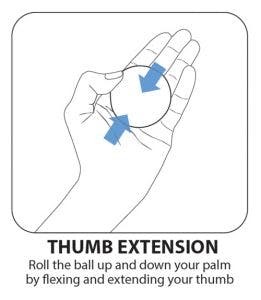 Then, use your thumb to roll the ball up and down your palm. This movement really isolates your thumb. 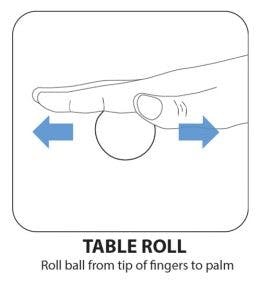 Roll ball from tip of fingers to palm. Place the hand therapy ball on a table and place your hand on top of it. Then, while keeping a flat hand, roll the ball from the base of your palm up to your fingertips. 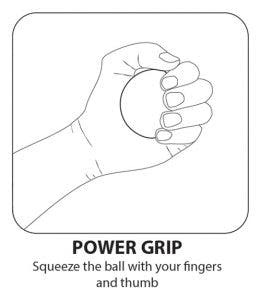 Press your fingers into the ball. Unlike the Power Grip exercise, you won’t be using your thumb in this exercise. Instead, hold the therapy ball in your palm and press into it using all your fingers except your thumb. 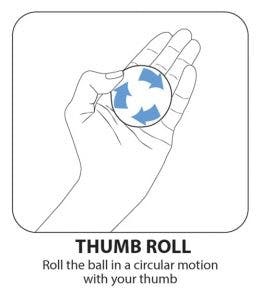 Roll the ball in a circular motion with your thumb. Here’s another exercise that isolates your thumb. Place the therapy ball on your palm. Keep your palm as flat as you can and use your thumb to keep it in place. Then, use your thumb to roll the ball in a circle on your palm. Squeeze the ball with two fingers. Place the therapy ball between two fingers and squeeze your fingers together. Squeeze and release. You can do this between any combinations of fingers, so be sure to exercise all your fingers! Some fingers will be more difficult than others (like your ring and pinky finger), and those are the fingers that could use extra attention. 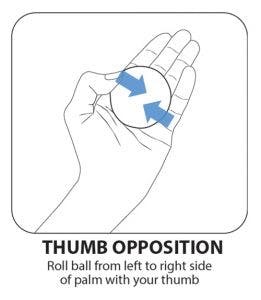 Use your thumb to roll the ball from the left to the right side of your palm. This exercise is similar to the Thumb Roll, but you will be rolling the ball side-to-side instead of in circles. So, place the therapy ball on your palm and use your thumb to keep it in place. Then, use your thumb to move the ball from left to right. This really isolates your thumb. 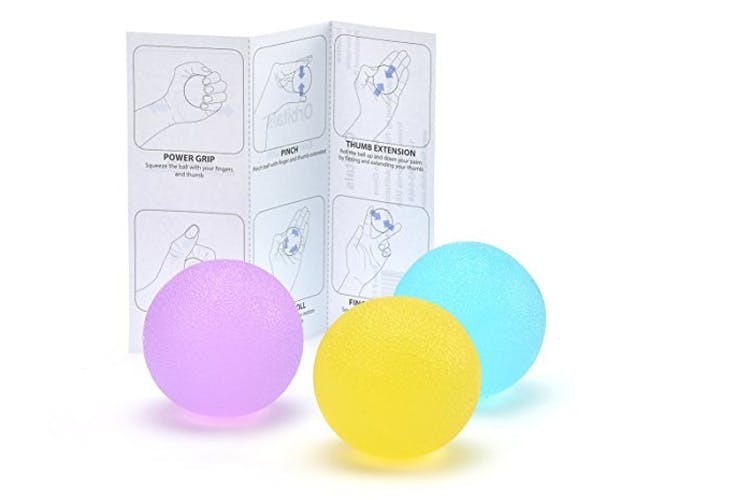 If you need a set of stroke therapy balls, Amazon is a great place to look. You may also like therapy putty exercises too! They’re even more popular.